Could Mountain View’s Endorsement Jumpstart Silicon Valley BRT? Mountain View voted in favor of dedicated lanes for bus rapid transit on El Camino Real. Rendering courtesy VTA. In its current form, Silicon Valley’s El Camino Real caters almost exclusively to private automobiles, leaving pedestrians and transit riders in the dust. But a recent decision from the Mountain View City Council may shift the boulevard’s car-first status quo. 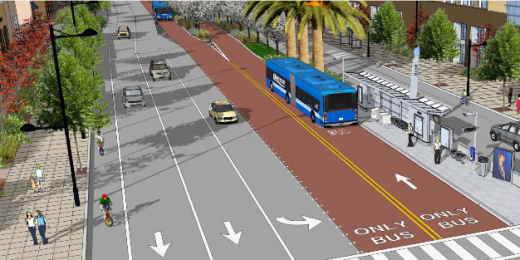 Last week, city leaders voted 3-2 in support of dedicated lanes for the Santa Clara Valley Transportation Authority’s El Camino Real bus rapid transit (BRT) project. The council supports a project that would reserve two lanes of the busy thoroughfare for buses, speeding up the notoriously sluggish and crowded 522 and 22. Mountain View’s vote is advisory, given that El Camino Real (State Road 82) is a state highway and VTA can work with Caltrans to implement the proposed project. VTA’s board will soon decide which project alternative to choose, and the advisory votes from the six cities the project would serve will assuredly play a role in their decision-making. The board will be choosing a preferred project among seven that were studied in an Environmental Impact Report. 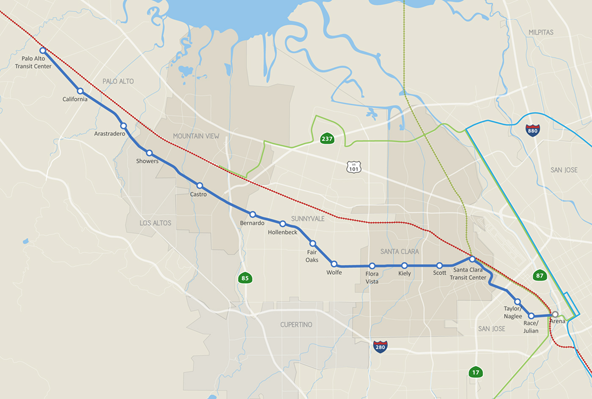 The options offer a range of dedicated lanes (between 0 and 13.3 miles of dedicated lanes between San Jose and the project terminus in Palo Alto). Dedicated lanes throughout would reduce travel time across the line from 85 to 48 minutes and allow buses to run at 10-minute intervals, a dramatic time savings for bus riders. (20 percent of VTA’s bus riders use this route.) Prior to last week’s hearing on the proposal, SPUR sent city council members a letter urging them to support this important piece of the Bay Area’s transit puzzle. Their decision to green-light truly rapid bus service is a small but important victory for sustainable transit and smart growth and could tip the scales in favor of rapid transit. Among VTA’s proposed BRT project options, the one that includes the longest distance of dedicated transit lanes (13.3 miles from San Jose to Palo Alto) would cut travel times by almost half and enable 10-minute service. Courtesy VTA. The Mountain View City Council hasn’t always viewed BRT favorably. Two years ago, the city voted down plans for dedicated bus lanes, citing fears of increased congestion on neighboring streets. Similar concerns could prevent VTA’s project from moving forward in Palo Alto, Sunnyvale and Los Altos. The Mountain View council’s nod in favor of the project could help officials in those cities to change their minds and follow suit, potentially allowing the VTA to realize its goal of creating more efficient transit connections between San Jose and Palo Alto. In order for the project to realize its full potential and serve as a viable alternative to driving, it would need dedicated transit lanes through every city along the proposed route. VTA’s project timeline — if everything goes according to plan — currently estimates a 2018 opening. While El Camino BRT’s future still remains uncertain, one thing is sure: El Camino’s current configuration cannot effectively keep up with Silicon Valley’s record-busting population growth, and traffic conditions along the corridor are projected to worsen in coming years. For the growing part of the population that doesn’t drive, transit is an unreliable and slow choice, since buses are snarled up in the boulevard’s perpetual gridlock. Rapid bus service would divvy up street space more efficiently, moving far more people than private autos can — and in a smaller amount of space. What’s more, higher transit speeds would also improve cost-efficiency: The dedicated lane option would serve 18,000 daily riders at an annual cost of $13 million, compared to $19 million to serve 12,000 daily riders today. BRT would also redesign the street to better accommodate pedestrians and cyclists, while improving streetscape conditions and quality of life. Mountain View’s approval of BRT on El Camino Real is evidence that Silicon Valley officials recognize the need for viable alternatives to private vehicles. Implementation of the project would signal an important change in Silicon Valley’s transit status quo. Rapid bus transit routes are key to unlocking the potential of our regional transit network and are needed for quick connections with Caltrain, ACE and the Capitol Corridor, as well as the anticipated BART Silicon Valley Extension. The need for rapid and reliable public transit persists — and will accrue in tandem with the region’s burgeoning population growth.